A dry, woody and ambery eau de toilette with Vetiver Root; a rich, heavy, warm, sensual essential oil, Green Tea; a pure and earthy blend that refreshes the skin and Cedarwood; a stimulating scent with a warm, deep almost opulent as its wood. I purchased this for my boyfriend who is a message therapist as I wanted something subtle for both work and social and home. This is lovely, not overpowering in the least and described perfectly. Wasn't sure what 'green tea' would smell like but it's pleasant and works well with the cedarwood. I would recommend this as a subtle and attractive cologne. A good value for money fragrance that's not too heavy. This will become a staple! 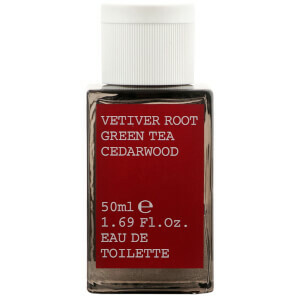 Vetiver Root Green Tea Cedarwood is brilliant. Women seem to love it and my girlfriend can't get enough. Very fresh, also fruity in a masculine way. Different, but definitely not weird. Clean, fresh, bright, masculine, signature. I love it.